Calming Baby is as Easy as S, S, S.
After those long, hard months of pregnancy, the last thing you want is total exhaustion. The human body needs rest to recuperate from pregnancy and childbirth, especially if you just had a C-section birth, but baby needs round-the-clock care, so how can you manage both? The S-S-S technique will surely bring your baby calm and you a lot more rest during the first 12 months of life. The womb is a tight space and that's where baby's been for the last 40 weeks. Suddenly that warm, tight space has changed into this huge open area and baby doesn't know how to process the change. Crying is the only thing baby can do to get your attention, but there is a way to give baby that snuggly feeling outside of the womb. Lay a blanket down and fold one corner toward the middle to create a flat side. Fold one corner only. Lay baby down with his neck in the spot where the flat side was just created. Fold the bottom corner of the blanket up over baby's feet. Grab the left corner and fold over baby's body; tucking the corner under baby. Next, grab the right corner and repeat, tucking the right corner under baby snuggly. This is called swaddling. While many people think baby wants quiet - that's the last thing he wants. He's been living in a loud environment and he needs that loud noise to comfort him to sleep. White noise is the best choice, but it needs to be louder than you think. The noise should be about as loud as baby's cry to initiate the calming sensation. At night you can reduce the sound slightly to ensure you still hear baby wakeup. 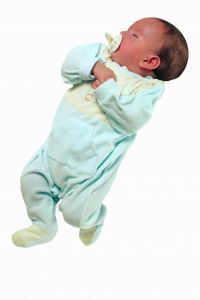 Baby's are born with a sucking reflex and that reflex gives baby pleasure. Sucking can include breastfeeding, bottle feeding or use of a pacifier. You'll have to work through the ins and outs of your baby's preference. Some parents even try to initiate thumb or finger sucking to calm baby. Using the S-S-S technique is a simple way to keep baby calm, increase sleep time and create a quiet home where you can rest more often and catch up on that healing sleep you need to recover quickly.